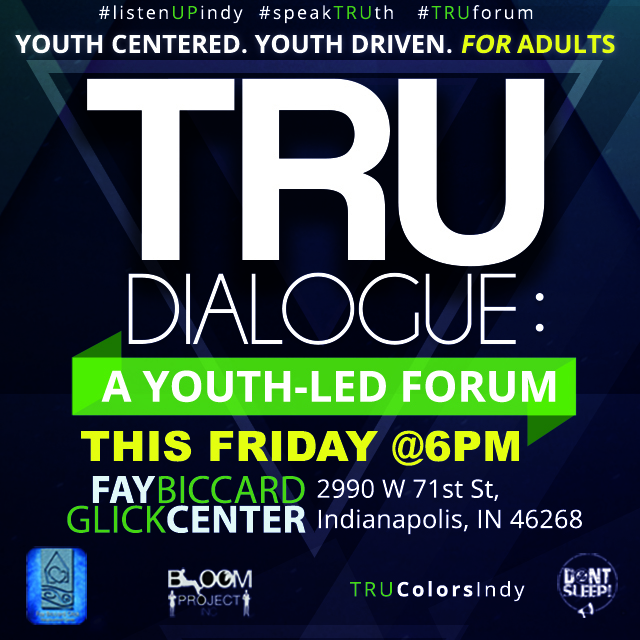 On behalf of the TRU Dialogue Host Committee, we would like to send a thank you to everyone who has agreed to participate in this all important conversation on youth, by youth, for adults! We realize you must have questions, or even things you may seek clarifications regarding issues you assume are common to youth and young adults. We want to know what those questions are! Please submit your questions to us in response to us at bloomprojectinc@gmail.com, this will greatly assist our panelists and table captains in structuring the conversation in a way which is informative and edifying for all participants. If you have more than one question to submit, this is acceptable as well, but please refrain from submitting multi-part questions. ← DONT SLEEP is a finalist for Neighbor Power Indy’s “Connecting Community” Award!